The situation in our freezer has reached something of a crisis point. There is now no room to do anything other than open up the freezer, toss something in, then shut the door really fast so that it doesn't come spilling out. There have been far too many good deals recently that I have taken advantage of and thrown into the freezer. Along with the leftovers from Canadian Thanksgiving and the regular things we have in inventory it has reached a boiling point. Or a freezing point. 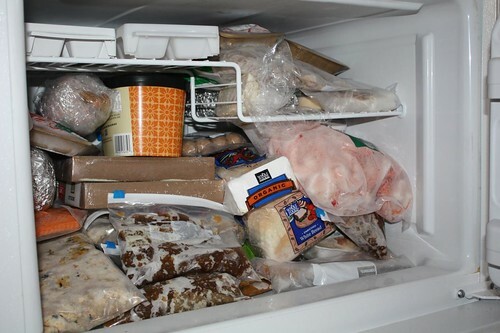 Or just a point where we really need to start using up some of the stuff in our freezer. I thawed out some chicken breast and some fresh fettuccine last night and decided that I would do something with them. However, I was not really sure what. This afternoon we went to Tarry Market to check it out. It was pretty nice but I resisted the urge to buy anything and add to our pantry, fridge, and freezer surplus. We also went to the Farmer's market and walked around, again purchasing nothing and making the commitment to just use the ingredients we had at home. I seared the chicken breast (on the bone) which I'd rubbed with salt, pepper, olive oil, and sage. Then I tossed some onion, garlic, and wedges of pumpkin in the pan and roasted it all in the oven. When it was done I added some ricotta from Liuzzi Cheese in North Haven, Connecticut. I've been sitting on the cheese for a while (not literally), waiting for the perfect occasion to use it. It is dated to expire tomorrow so tonight it seemed like the perfect occasion had finally arrived. It's also worth noting that this may be the best ricotta I've ever had. After added the dollops of ricotta I threw it into the broiler to melt the cheese for a few minutes then took it out and topped with fresh sage leaves that I'd previously fried in the pan with the chicken. I also rendered some salt pork (also from the freezer) but opted not to use it as I think it may have been past its prime. The end result was far better than I'd anticipated and I was glad that the salt pork didn't work out since it would have been unnecessary. In a world of pumpkin beer, pumpkin coffee, pumpkin ice cream, pumpkin soup, and pumpkin cheesecake (half of which have no pumpkin but rather just pumpkin pie spices added to them) it's comforting to return to the original: straight pumpkin. 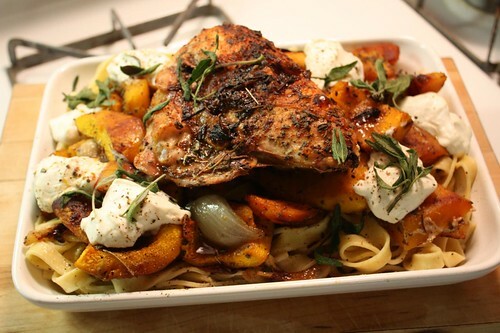 In my book it doesn't get any better than just roasting it. This is a pasta that I will certainly make again. Though next time maybe I'll add a graham cracker crust and season it with cinnamon, nutmeg, and allspice.